Here's an industrial shelf layout that I designed for Model Rail Radio. It's tightly packed with close clearances but. if done with typical brick, high rise (5-6 story) urban buildings, moderately weathered and sprinkled with detritus, it should be a scenic success. 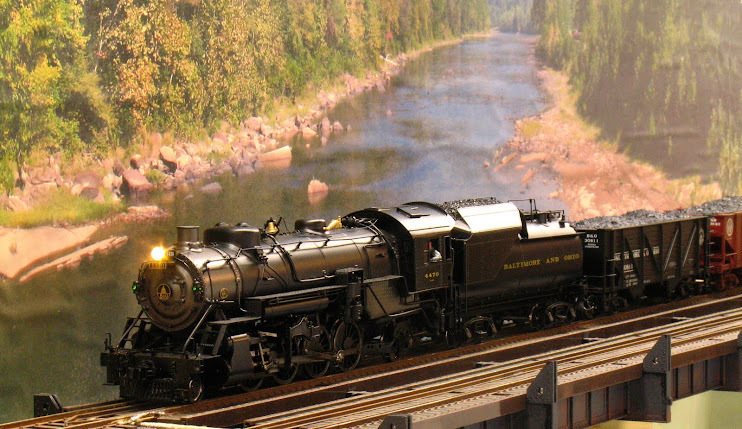 It's designed for 2-rail O Scale (or P48)but may be do-able in 3-rail sectional track. Click on the drawing to enlarge. Design notes follow the drawing. Curves, what few there are, are 26" minimum radius - tight, but with short (40') equipment it will look OK, No equipment needs to couple/uncouple on curves, nor be parked on curves. All turnouts (except one) are #4, drawn to NMRA minimum dimensions. Can substitute old (1970's) Atlas/Roco O turnouts (check loco compatibility) and free up some space. One 30/26 radius custom-built turnout. This one will have a LONG frog, probably #12 or better. Extensive use of switchback setouts will require moving cars already spotted to position new cars. Two car capacity on the run-around limits the number of cars that can be pushed/pulled into position in a single move. Estimate 2-3 hours to move and spot all cars on the layout. All buildings are 5-6 storied high and the layout is high enough that the tops of the buildings are at or above eye level. This creates the feeling of an urban canyon and hides the building-to-backdrop transition. (A) Large industry - Brewery, urban bakery, freight storage warehouse, paper mill, etc. chosen for car variety. Hides one of the traversers. RHS wall removable to fiddle cars onto and off of the traverser. (B) Freight house/meat packing/cold storage/produce distributor. Semi-flat against wall, two track awning over house tracks or tracks in open-air arcade under building. Second loading track served by 'bridge plates' between cars on the nearesst track and cars on the outer track; complicates loads/empties spotting. (C) Irregular shaped building built on 'air rights' (stilts) over the tracks. often found in crowded urban areas; adds scenic interest. One spot loading dock underneath. Unfortunately, the building sits atop one turnout; prototypical, but could be a maintenance headache. (D) Semi-flat buildings against wall. Set at irregular angles helps disguise the rectilinear arrangement of the track on the shelf. 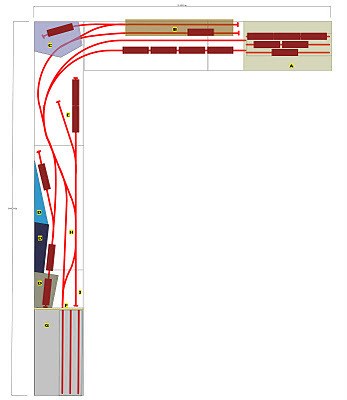 Tracks enter one structure, loading doors in the walls of the others. (E) Open-air industry; iron works, scrap yard, sand& gravel, fuel (oil or coal), concrete, etc. (F) High retaining wall with portal. 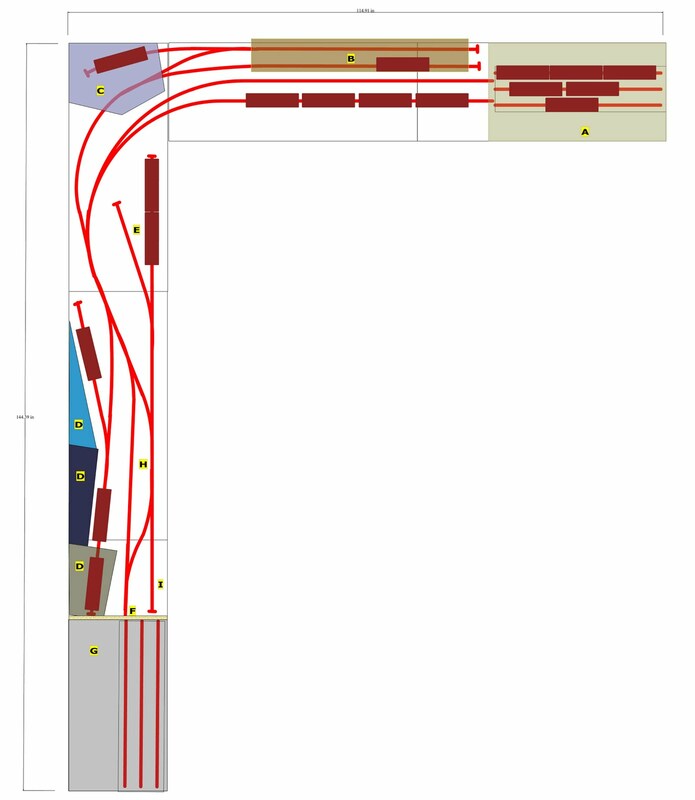 This is the layout's 'beyond the basement' connection and portal to the other traverser. (G) large building built on a bluff above; hides the traverser and continues the urban theme. The end is left open to fiddle cars onto and off of the traverser. (H) Run-around, two car capacity; limits the size of set-outs, slows down operation. (I) Loco pocket or team track. All clearances are tight and a lot of 'No Clearance' and 'No Clearance for Man Riding Car' will be prototypical. The two tracks leading into industry A need to be shifted slightly towards the front of the layout to assure clearance with the tracks at industry B. Check and adjust clearances around industry C where the track comes near the wall. If desired, the layout can be modeled as a harbor scene, with the harbor located in the aisle. the aisle side of the layoout is them modeled as bulkhead; industry A and E then have water-borne service as well as rail serevice. Tracks leading into industry A can double as pier tracks for rail/water transfer with an impressive traveling overhead crane. Could be done as traction; the wire entering the buildings would make for some interesting wire work. This layout could probably handle a collection of 100+ cars so that cars do not repeat trips to any given industry too often. It's an interesting plan Terry. I am a little concerned at the proximity of the nearest track to the wall after the loop from the horizontal to the vertical. I'm thinking of something similar to this but just using the two tracks closest to the edge with the loop around. Aiming for something simple initially. Anyway thanks as always for all your efforts here!